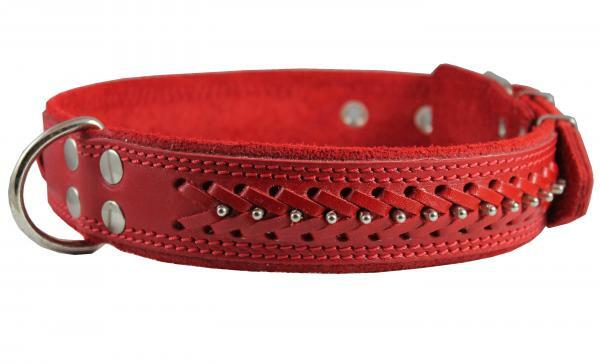 Comfort meets high quality and durability in this fabulous braided dog collar of high quality genuine leather. Elegant short dull studs and braid, soft suede padded, stitched all around design. Very comfortable and pliable. Strong and durable. Features metal enforced eyelets and nickel plated hardware. Short dull studs and Brade make collar look really sharp. Trimmed with thick contrast color waxed thread. Over sized soft suede leather padded. Overall length 27", 1.6" wide, will fit 19"-24", 4 adjustment holes. This size is most suitable for Large and XLarge breeds.